Special honour should be given to Robert Wilkinson Latham, Ron Flook, Michael Silvey and Tom Parker for their assistance with photos of some very rare items. To understand why the Fairbairn-Sykes Fighting knife became such a very good composition, we have to study the history of their lives and this especially from their time in Shanghai. William Fairbairn left his home in Rickmansworth, Herts, England when he was fifthteen and joined the British Royal Marines. He was very skilled with fighting with bayonets. He won the annual championships for the military. 1917 he resigned and started to work with Shanghai Municipal Police force, (SMP). This was a police force for the international colony in Shanghai. At that time Shanghai was considered to be the most dangerous place in the world. He was once attacked by a gang of Tong members in the red light district. They left him on the ground more dead than alive. He was lucky and survived. He realised that he might not be so lucky next time. He started to train Jujutsu with professor Okada in Shanghai. Later he was accepted by Kodokan Judo University in Tokyo. He got the third degree of the black belt 1931. W. E. Fairbairn founded the first SWAT team. 1921 he became inspector and in charge for the training in man to man fighting and fighting with small arms. 1935 he became assistant chief of the police with SMP. 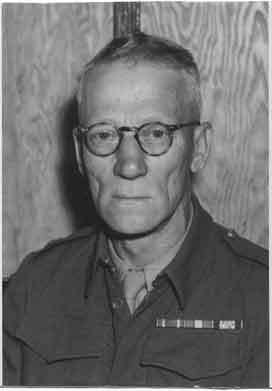 Eric Anthony Sykes (5th of February 1883 – 12th of May 1945). ”Bill” Sykes was born in Barton on Irwill. He came from an upper middle class family and his family name was Schwabe. He had been an officer at a sniping unit during the Great War. He changed his family name to Sykes which sounded more British. He worked with a security company in Shanghai which selling small arms. This company was run by the British Secrete Service Here in Shanghai he met Fairbairn. They became very good friends. These gentlemen realised that anybody who expects to be involved in a fight better use all the upper hands possible. Fairbairn said that a man with the knife as the upper hand compared to an unarmed man, even if he is well trained in martial arts. 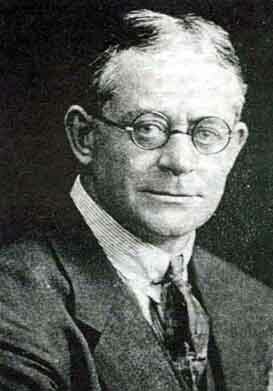 This passport photo is the only known picture of ”Bill” Sykes. It was here in Shanghai 1931 they started to develop a new type of knives. The knives were made at the Shanghai Municipal Police (SMP) Armoury. It was under the supervision of a former White Russian Colonel, Nicholas Solntseff, his staff made knives on a custom basis for U.S.M.C. officers and others. This is an excellent book and it describes the only true Shanghai knives. 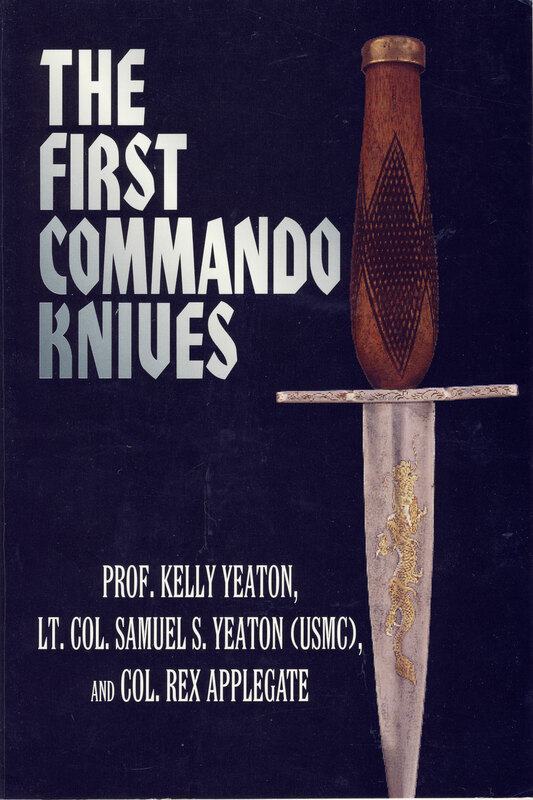 Outside Prof. Kelly Yeaton's book you can see a true Shanghai Fighting knife! In this book you can see some examples of the very rare original Shanghai knives. It describes the life in Shanghai from 1932 onwards. It is a very nice book and on the outside you can see the knife of the Yeaton brothers. The knife was carried in a scabbard hidden but easily accessible. This scabbard was a very important part of the knife system. Nobody knows how many custom knives were made; the number of known examples is extremely small. Most Shanghai knives you will find are fakes or copies! 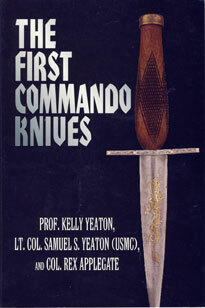 Most serious collectors nowadays agree too that the only true Shanghai knives are those pictured in Prof. Kelly Yeaton’s book. Unfortunately there is some very well known literature in English from a very well known author, which is not reliable. The pictures shown in that book are fake Shanghai knives! Dr. Windrum believed in these knives. Let us make some criticism of his sources. If we analyse his writings we will soon become aware of that many of these knives came from the same source. This source had a very strange ability to "uncover" or “find” all sorts of odd prototypes and experimental knives owned by Fairbairn. according to well known experts! Like in many fields of collecting, the fakers can completely mess things up! NEVER BUY A SHANGHAI KNIFE WITHOUT PROVINENCE! As you can see the so called Shanghai knives shown below here are all fakes and differ from the originals shown in Yeaton's excellent book in terms of materials and some design features. 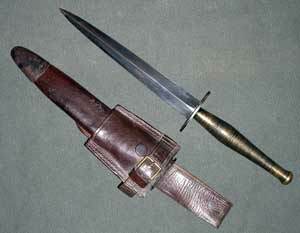 Lee Metford M1888 bayonet later pattern. Note the two bolts through the wooden grip, which will make it unsuitable as raw material for a fighting knife. Some say that the son of William Fairbairn, John Edwin Fairbairn, who also was working with SMP in Shanghai, has told the story how the knives were built. They used British Lee Metford bayonets M1888. These bayonets had excellent steel. We are told that they cut the bayonets in two parts and made two knives from each so they became rather short. 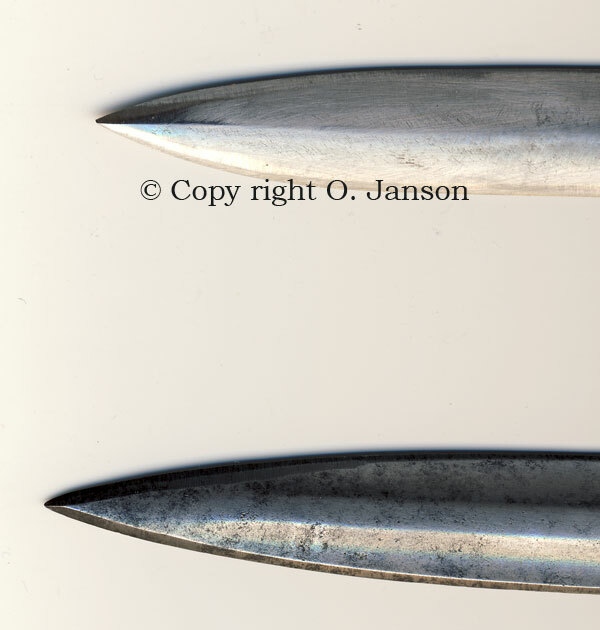 The width of the blade was kept like the bayonet blade. This can however not be entirely correct, because if we study the tang of a M1888 bayonet it has two or three big holes for assembly of the hilt. For this reason the tang has to be repaired or at least extended which will make the construction weak. If we study the front part of the M1888 blade, it has a significant ridge and concave edge. None of the original reported Shanghai knives have concave edges. (See the picture on this page). There are several more technical indications about the contradictions in this story which are reported in Robert Wilkinson Latham’s book. We have to handle all these fancy stories with scepticism and remember that they were part of the propaganda machinery during WW2. To this we can add collectors who of course don’t know the true history but add what they believe to be true. This is an acceptable way or converting an 1888 bayonet into a knife. Shanghai knife with a grip of Ivory. The grip is made from ivory. 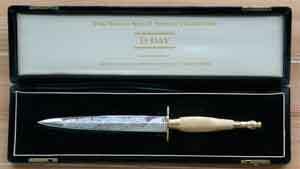 The Ivory grip dagger is 241 mm (9.5 inches) long. The blade is 140 mm (5.5 inches) long including habaki. The thin aluminium crossguard is 64 mm (2.5 inches) wide. It was originally black, and it has the SMP tulip stamp on the top of the crossguard. The white ivory handle is 100 mm (4 inches) long and 19 mm (0.75 inches) thick. The knife handles were made from a variety of materials, brass, wood, horn. The end pommel caps were made from shell casings. Everything was made by hand, similar models are seen but with different handle materials or blade styles. The grip is made from ebony. This is most likely a so called Shanghai knife. The leather scabbard can be hanging upside down or sewn in your clothing. 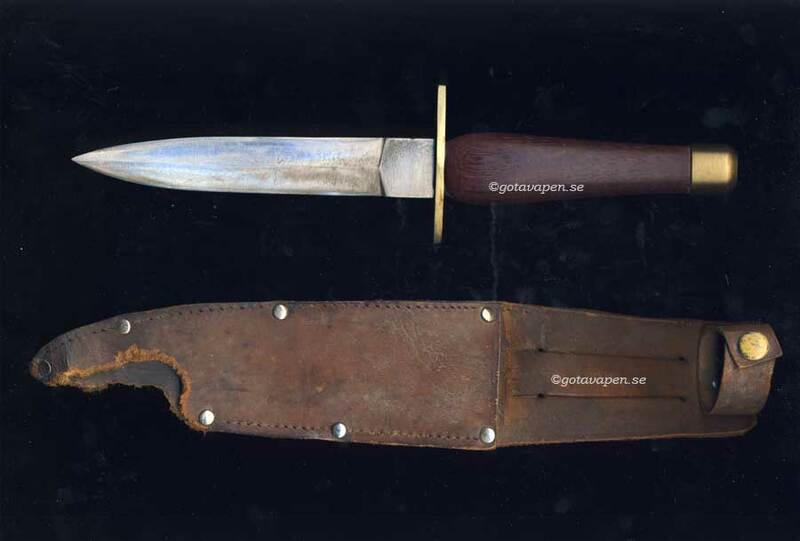 This is the knife on page 24, photo 3 in ' The Earliest Commando Knives' by Dr. William Windrum. This might be a genuine Shanghai knife. The ebony handle has horizontal grooves in the middle, there is crosshatching for the thumb ramp. The crossguard is made of brass. The knife itself is 248 mm (9.75 inches) long. These two knives from Windrums collection. 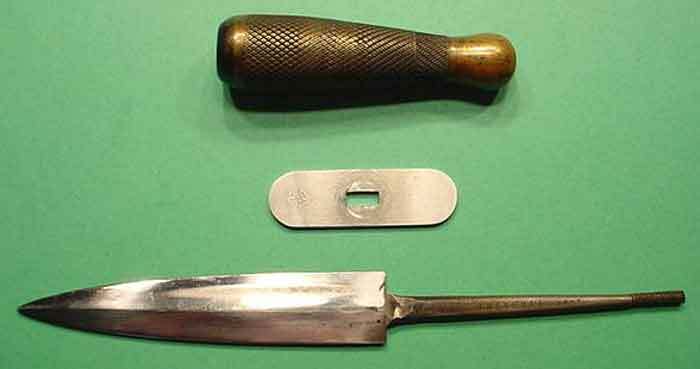 The bottom knife with white boxwood grip is concidered by many collectors to be a fake because of the ricasso. See more about this knife below. The knife with light coloured wooden handles has 5.5 inches blades, thick aluminium cross-guards, brass ferrules, handles of wood and brass pommels with threaded tang holes drilled through. 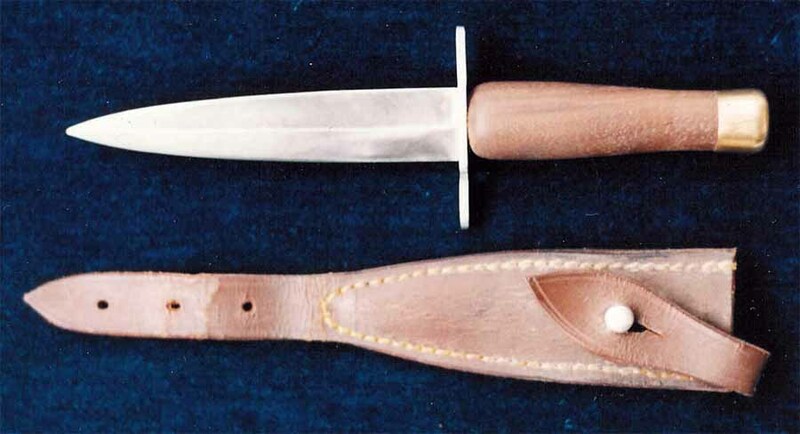 This knife was made of a blade from a British M1903 bayonet which was made in March 1902. The ricasso has India acceptance arrow. This knife resembles the knife of the Yeaton brothers, except this knife lacks the engraving and fish haut cut handle. This blade is 122 mm = 4.80 inches. It is the shortest known knife. This knife also resembles the knife of the Yeaton brothers but this is also considered to be a copy. This blade is 135 mm (5.3") and the length over all 245mm (9.6"). W.E. Fairbairn’s Shanghai Dagger 1937. The dagger below is claimed to be W.E. Fairbairn’s personal dagger. This is most likely not the case! It is most likely a fake. This knife is stamped on the tang-Shanghai-with the year date of 1937. Overall length of the knife is 232 mm (9.13 inches). Blade length is 125 mm (4.94 inches) long. Claimed to be W.E. Fairbairn’s personal dagger? As you can see from the picture below it is far too weak to be used by such an expert! The blade is said to be made from the tip of a M1888 bayonet with sides of the diamond cross section blade. It has a full but welded tang. The cross guard is thin aluminium, flat sided with semicircular ends. The grip is heavy knurled brass. It has roughly the same shape as all the other Shanghai fighting knives. A whole goes through most part of the pommel and it is threaded in the end. The pommel screws on to the blade tang and eliminates the need for a pommel nut. The tang has been welded to the blade as you can see. This is not the way to make a fightingting knife or sword! Compare it to the bayonet below! W.E. Fairbairn retired from his command in Shanghai and returned to Great Britain 1940 together with his friend E. A. Sykes. Sykes very good connections with the Secrete Service arranged new challenges for them as instructors for the Commandos and SOE. Both became Captains. The man who helped to get Fairbairn and Sykes over to UK was Captain (later Colonel) Leslie Wood R.E. There are many doubts about if this is the true story or just a fairy tale. According to Robert Wilkinson Latham the entire story about manufacturing knives from old bayonets is impossible. For sure there are many, many fakes out which are made from cut up bayonets. It is very hard to have confidence in the authenticity of any such knife!